How Much is Laser Skin Tightening Cost in Dubai? As we age, the collagen production levels in the skin drop. The effects of gravity are also significant. Resultantly, the skin becomes loose and sagging. The laser skin tightening, which a non-surgical skin tightening, is a safe and effective method to lift the skin naturally. This blog post sheds light on the laser skin tightening cost in Dubai. Continue reading to learn more. Before the discussion about the cost of laser skin tightening kicks off, let’s first have a bird’s-eye view of a typical laser skin tightening treatment. As its name suggests, a laser machine is used to perform this treatment. At the Euromed Clinic Center, the latest and the safest laser machines are available to tighten and lift your skin efficiently. The treatment takes a short time to finish and there are no major and permanent side effects. The laser skin tightening cost is high in some countries such as the US and the UK. In the UAE, the cost is not high and clinics like ours offer it at a reasonable price. The price ranges from $500 to $3,000 because there are some factors that help calculate the actual cost of treatment. Let’s now discuss the laser skin tightening cost in Dubai. The laser skin tightening is different for different people because the skin tone, skin condition, and skin type are different for different people. Keeping the individual differences in mind, the laser skin tightening cost in Dubai varies from person to person. What kind of results are needed? The results needed may differ for different people. That is why the professional calculates the cost after knowing the type of results needed by the patient. What is the size of the treatment area? This treatment could be performed on the face, neck, chin, and many other areas of the body. The large body part definitely cost more than the shorter ones. Where is the treatment facility located? As mentioned above, the location of the treatment facility also matters when it comes to calculating the cost. The treatment costs more in New York City than that of Dubai. What kind of skin problem are you facing? Different people have a different level of skin sagging and looseness. The cost of the treatment will be less if you take it in your forties and the cost will be higher if you take it in your sixties. How many treatment sessions you need to take? The laser technology delivers results gradually. The professionals perform the treatment in short sessions to avoid the side effects. What is the level of expertise of the professional? The qualification and experience of the professional is another price-defining point. A board-certified dermatologist charges more than a laser technician. 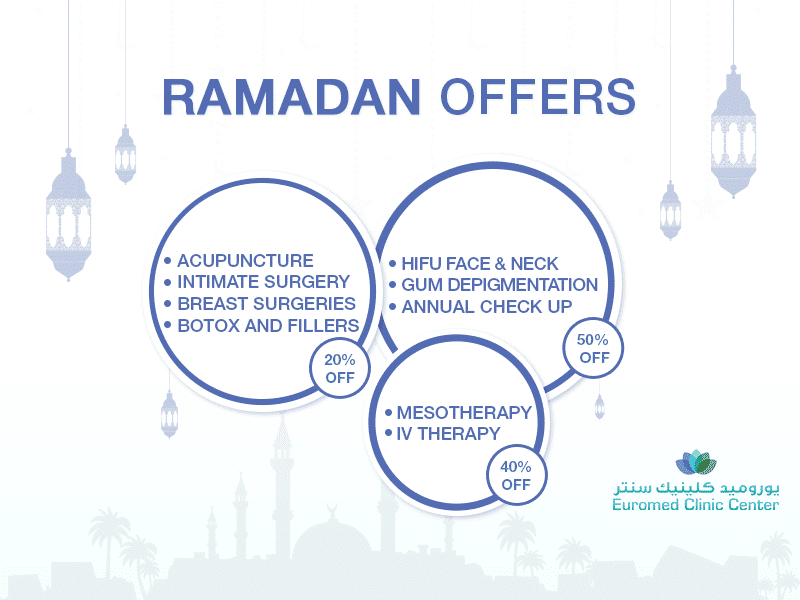 For a limited time, the Euromed Clinic Center Dubai is offering non-surgical skin tightening at a reasonable cost. Please feel free to contact us if you need to know the exact treatment price. If you want to learn more about laser skin tightening, the experts at the Euromed Clinic Center Dubai are available for a quick call or chat. Please call us now or fill the short online form to book your appointment. We are waiting at the chat box. Let’s have a quick chat!